Johnny Boy has been waiting for this moment for a long time, where my two favorite loves, Art & Cocktails (drinking), collide into a monthly event. Enter The Drawing Room, an idea conceived under the creative direction of chic girl about town Eunique Fowler, curated by Dominique Breard, and hosted by The Freehand Miami + The Broken Shaker this Friday, July 12th at 8pm. 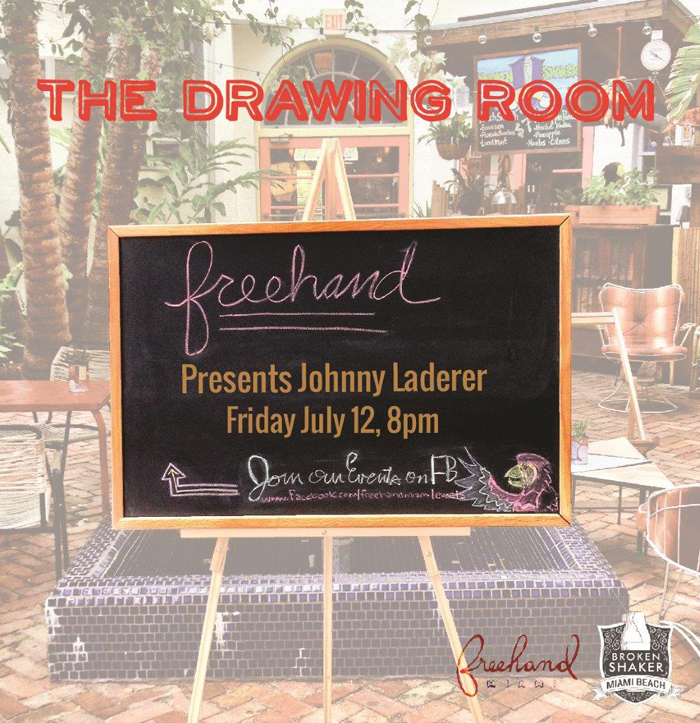 Each month a Miami-based artists will be invited to incorporate their work throughout the style and space of The Freehand Miami. Inspired by the artist's artwork and pallet preference, The Broken Shaker will create a custom cocktail, intertwining the two crafts into one rousing escapade. The inaugural edition of The Drawing Room features artist Johnny Laderer, presenting site-specific sculptures created from found objects. A Florida-native, Laderer’s work focuses on the clash between tropical flora and fauna, and urban developments in South Florida. Picture a tree effortlessly growing out of a crack in the concrete of the connecting highways of I95, this frontier between progress and decay is where Laderer’s work lives. He appropriates iconic Florida elements such as Deco style, citrus colors, and palm textures, and meshes them into an iconography that better represents Florida than any “Wish You Were Here” postcard.